When creating a footprint for BGA style components, improper pad design can lead to hordes of manufacturing issues and hours of failure analysis. Proper pad design is critical to ensuring the manufacturability of BGA components. Fortunately, by following a few simple guidelines, creating proper footprints for BGA components isn’t difficult! There are two basic forms of pads implemented for BGA footprints: the Solder Mask Defined pad (SMD) and the Non-Solder Mask Defined pad (NSMD). Let’s take a look at these two types and discuss how to use them in your BGA designs. In the top-down view we can see that the solder mask has been specified to cover a portion of the copper pad underneath. Defining pads this way creates two distinct advantages. First, the overlapping mask helps prevent the pads from lifting off of the PCB due to thermal or mechanical stress. Second, the opening in the mask creates a channel for each ball on the BGA to align with while the component progresses through the soldering process. The copper layer of a SMD BGA pad typically has a diameter equal to the diameter of the pad on the BGA itself. To create the SMD overlay, a reduction of 20% is typically used. 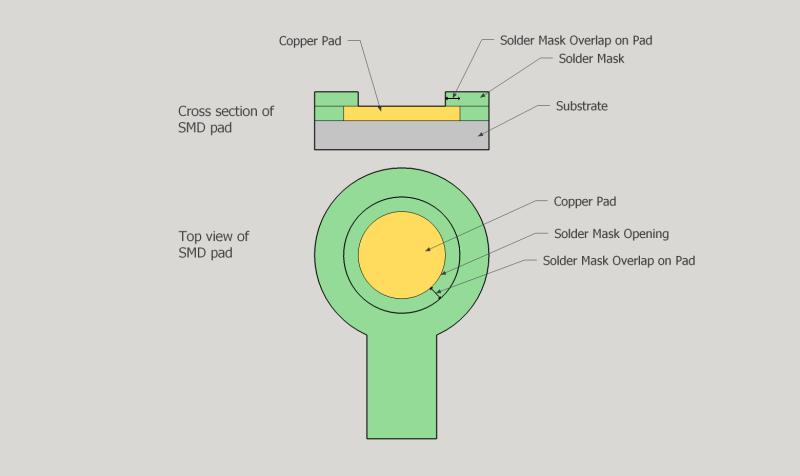 NSMD pads differ from SMD pads as the solder mask is defined to not make contact with the copper pad. Instead, the mask is created such that a gap is created between the edge of the pad and the solder mask. The following image shows a top and cross section view of a NSMD style pad. In this method, the size of the copper landing pad is not defined by the mask layer, but only by the diameter of the copper pad itself. 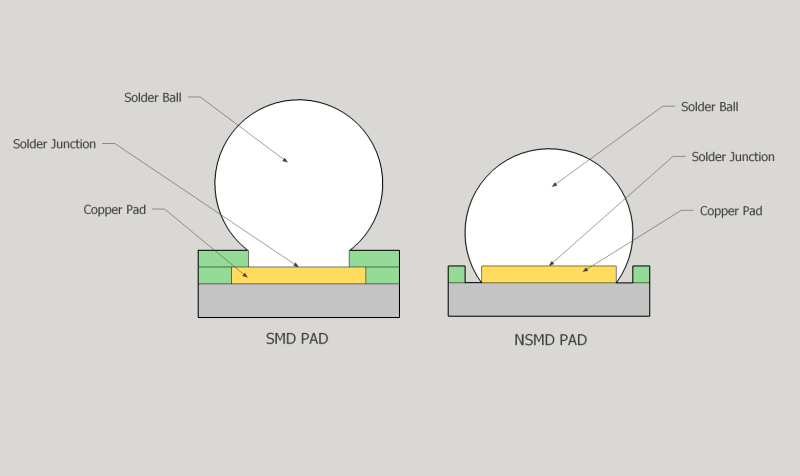 NSMD pads can be smaller than the diameter of the solder ball. Typically, this reduction in pad size is 20% smaller than the ball diameter. Since the pad size is able to be reduced with this approach, more room is created between adjacent pads allowing for easier trace routing. This can almost become a necessity when routing high-density, fine pitch BGA chips. NSMD pads have the unfortunate downside of being more susceptible to delaminating from the PCB due to mechanical and thermal stresses, although if standard manufacturing and handling practice are observed, pad delamination should not be an issue. 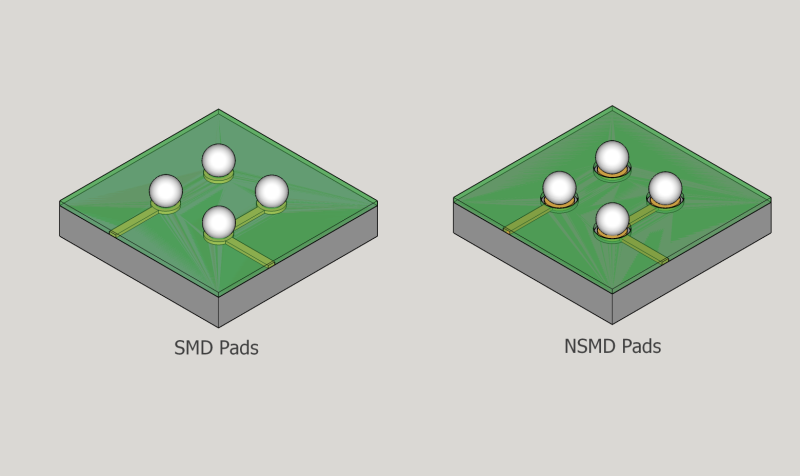 Because the entire pad is exposed, NSMD pads tend to have better solder adhesion than SMD pads. 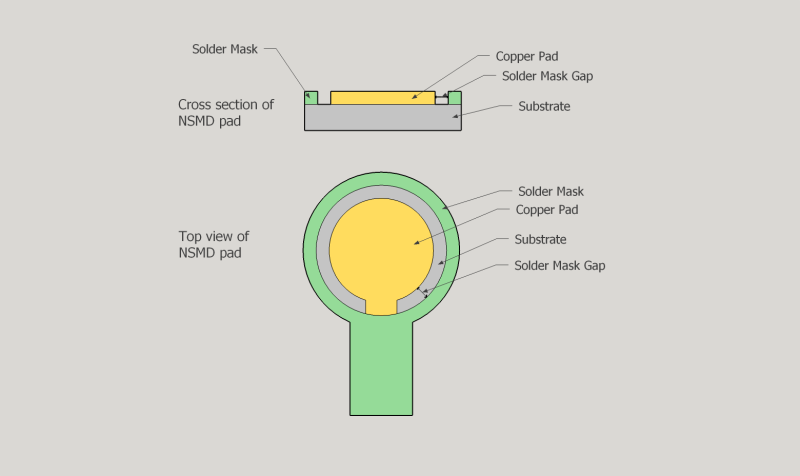 The solder ball is able to make a connection to the entire NSMD pad instead of the mask defined portion of SMD pads. It is important to note that component manufacturers typically provide recommended footprints in the datasheets for their components. When these footprints are available, it’s certainly advised to use them. In general, NSMD pad style is recommended wherever possible due to its improved solderability and pad accuracy. In the next blog post we will use NSMD pads to explore how to properly design and route a BGA footprint on a PCB.